As the following table shows, the TCJA almost doubled the standard deduction amounts from 2017 to 2018. Charitable contributions. Consider making bigger donations this year so that this year’s itemizable deductions will exceed the standard deduction. Then, next year, if your itemized deductions are less than the standard deduction, you can claim it. Medical expenses. Elective medical procedures — such as dental work and vision care — can be performed before year end to boost your itemized deductions. For 2018, you can deduct medical expenses to the extent that they exceed 7.5% of your adjusted gross income (AGI) if you itemize. In 2019, the AGI threshold for itemizing medical expenses is scheduled to increase to 10%. Home mortgage interest. Making your January 2019 mortgage payment this year will give you 13 months of interest expense to deduct in 2018. Although the TCJA put new limits on itemized deductions for home mortgage interest, you’re probably unaffected (because of the grandfather rules that apply to pre-existing mortgages). But double-check with your tax advisor to be sure. SALT expenses. You also can prepay state and local income and property tax (SALT) expenses that are due early next year. Paying those bills before year end can lower your 2018 federal income tax bill, because your itemized deductions will be that much higher. However, the TCJA decreased the maximum amount you can deduct for state and local taxes to $10,000 (or $5,000 for married people who file separately). Unfortunately, many taxpayers will be affected by this limitation, so for them it’s probably not as effective as prepaying other itemizable expenses. Important note: The SALT prepayment strategy can be a bad idea if you’ll owe alternative minimum tax (AMT) this year. That’s because SALT write-offs are completely disallowed under the AMT rules. Ask your tax advisor if you’re likely to be in the AMT zone for 2018. 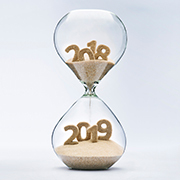 It’s also important to note that some itemizable deductions — such as deductions for unreimbursed business expenses and other miscellaneous expenses — were suspended for 2018 through 2025 under the TCJA. If you hold investments in taxable brokerage firm accounts, consider selling appreciated securities that have been held for over 12 months. In 2018, the maximum federal income tax rate on long-term capital gains is 20%. But many people will incur a federal tax rate of only 15%. For 2018 through 2025, the federal tax rates on long-term capital gains are no longer tied to the federal income tax brackets. After 2018, these brackets will be indexed for inflation. The 3.8% net investment income tax (NIIT) can also apply to long-term capital gains at higher income levels. To the extent you have capital losses from earlier this year or capital loss carryovers from pre-2018 years, selling investments that have appreciated in value this year won’t result in any tax hit. In particular, sheltering net short-term capital gains with capital losses is a smart tax move, because net short-term gains would otherwise be taxed at higher ordinary-income rates of up to 37% (plus the 3.8% NIIT if applicable). If you have investments that would generate a tax loss if they were sold, you might consider unloading them before year end to shelter any capital gains from sales earlier this year, including high-taxed short-term gains. If selling your losing investments would cause your capital losses to exceed capital gains, the result would be a net capital loss for the year. Your 2018 net capital loss can be used to shelter up to $3,000 of 2018 ordinary income ($1,500 for married people who file separately). This income may be in the form of salaries, bonuses, self-employment income, interest income and royalties. Any excess net capital loss from this year is then carried forward indefinitely until you have gains to offset against it. Net capital loss carryforwards can give you investing flexibility in the future, because you won’t have to hold appreciated securities for over a year to get a preferential tax rate. The top two federal rates on net short-term capital gains recognized in 2019 and beyond are 35% and 37% (plus the 3.8% NIIT if applicable). So, it could be particularly beneficial to have a capital loss carryover to shelter high-taxed short-term gains recognized in future years. While your income may be too high to benefit from the 0% rate, you may have children, grandchildren and other loved ones in the 0% bracket. If the object of your generosity is in the 0% bracket, consider gifting that person some appreciated stock or mutual fund shares that can be sold without incurring tax on the resulting long-term capital gains. Gains will be long term if your ownership period plus the gift recipient’s ownership period (before the recipient sells) equals at least a year and a day. Giving away stocks that pay dividends is another tax-smart idea. If the dividends fall within the gift recipient’s 0% rate bracket, they will be federal-income-tax-free. Important notes: If you give securities to someone who is under age 24, the so-called “kiddie tax” rules could potentially cause some of the resulting capital gains and dividends to be taxed at the higher rates that apply to trusts and estates. Many states don’t have a 0% tax bracket for capital gains and qualified dividends. Be aware that state taxes could apply. Generous people who are looking to share their wealth often ask: Is it better to give investments directly to family members and charities — or to sell them and give away the proceeds? From a tax perspective, the answer depends on whether you’ll incur a gain or loss on the sale of an investment. In general, it’s better to sell shares that would incur a loss and then give away the proceeds. Conversely, appreciated shares should be donated directly to recipients that would incur no tax (or be taxed at a lower rate). For example, Sam owns stock that’s decreased substantially in value since he bought it in 2016. He wants to make a year-end gift to his niece Barb. Sam’s tax advisor recommends that he sell the investment and book the resulting tax-saving capital loss (to offset capital gains in 2018 and beyond). Then Sam can give the proceeds from the sale directly to Barb. The same general principles also apply to donations to IRS-approved charities. But there’s an extra tax benefit: You also can claim tax-saving charitable donation deductions, if you itemize deductions on your federal income tax return. If you donate shares that you’ve held for more than a year, your itemized deduction equals the current market value of the shares at the time of the gift — and you’ll avoid paying capital gains taxes on those shares. Meanwhile, the tax-exempt charitable organization can sell the donated shares without owing anything to the IRS. These are just a handful of year-end strategies for individual taxpayers. Your tax advisor may offer more suggestions based on your unique tax situation. Act fast, however, because some tax planning moves take time to execute before December 31.